Hi GSD lover, I have a 4 month old GSD puppy. His name is Boono. I got him 3 months ago. He is very cute and intelligent. His ears recently became erect. He likes sitting on sofa and beds instead on the floor. In this photo he is sitting on my newly purchased sofa in a rather 'royal' style. His fur coat is very soft and shiny. I feed him GSD special royal canin. I thank you making this wonderful site. The site was helpful to me when a few months ago i was interested in getting a dog but i was not sure which breed i should go for or and which factors i should keep in mind when getting a GSD puppy. 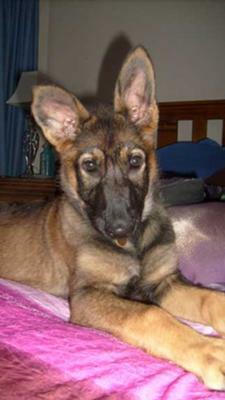 Total German Shepherd: I'm so glad we could help you - keep the pictures coming in!